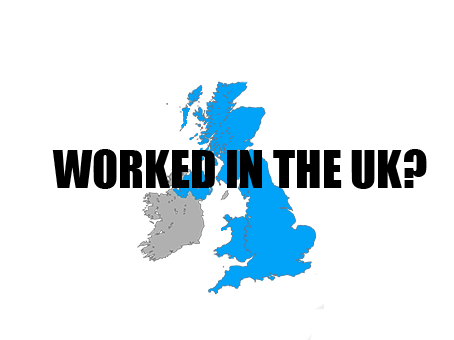 400 000 people living in Ireland have at some stage lived/worked in the UK. While working in the UK, many people have built a considerable amount of UK pension investments, i.e. state pension, employer pensions and defined benefit schemes. When leaving the UK to move back to Ireland, these accrued benefits may have been left behind. From our experience, many people are not aware of their UK pension entitlements and often forgo the opportunity to obtain the benefits to which they are entitled. We track and trace your benefits for State, Employer and Personal Pensions on your behalf. Irish Pension Solutions Limited does not have Professional Indemnity Cover in relation to the provision of advice on and the sale of this unregulated service. New legislation has come into effect. The April 2016 changes mean you will need 35 years to qualify for the full UK State Pension. Each year you have worked in the UK is worth 1/35th of £155 per week, subject to a minimum of 10 years. Therefore, you will have to accrue a minimum of 10 years contributions to receive any benefits at pension age. For example, take a person with 8 years of National Insurance contributions in the UK. They will need to accumulate 2 more years of contributions before pension age in order to claim the contributory UK State Pension. IPS is authorised to act on behalf of Irish residents to arrange for additional contributions. If these two years of contributions are arranged, this person will be able to claim a proportion of the UK State Pension at retirement equal to 10/35th of the full UK State Pension, estimated at €2,500 per annum. Irish Revenue Commissioners presently give UK state pension benefit capital value of €55,554. So it is certainly worth your while. As your agent, we seek approval for you to make additional contributions in the UK State Pension system and increase your entitlements. Each additional year of UK service purchased gives you an extra income of around £200 per annum. This equates to around €235 per annum (assumed exchange rate of 0.85). Again the Irish Revenue Commissioner gives a premium of €231 per annum a capital value of €6,930. We can arrange for you to purchase that additional pension value at a fraction of its worth. For those who worked in the Public Sector in the UK, you may have deferred benefits in an unfunded Superannuation Pension Scheme. We will find out what the projected value of these benefits will be. If you have retained DB benefits in an UK pension scheme, you will soon be prevented from transferring your pension out of the UK. Act now to protect your interests! If you have a private pension in the UK, we can get current valuation and assess the investments. We can repatriate these funds to Ireland if appropriate. Further details available from your financial advisor. We report back to you. This may take three to four months. To discuss your UK pension entitlements, contact a financial advisor near you.